Institute of Contemporary Art, 9780884541431, 300pp. 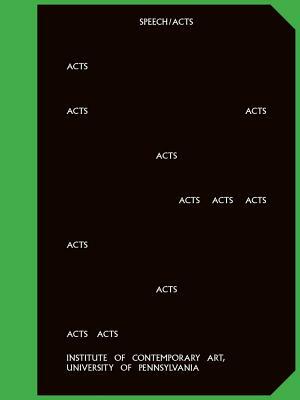 Speech/Acts brings together new and recent works by a generation of artists influenced by black experimental poetry. Recognizing language as a primary method of expressing and maintaining power, these artists use poetry as a tool to manipulate the conceptual and structural elements of language and the social contexts in which language is employed, appropriated and abstracted. Artists Jibade-Khalil Huffman, Steffani Jemison, Tony Lewis, Tiona Nekkia McClodden, Kameelah Janan Rasheed and Martine Syms all use experimental poetry in their work as a means to interrogate the power structures of language, rendering the experience of blackness more physically and affectively exact. In this volume, their work is presented alongside their poetic forerunners (seminal texts by Fred Moten and Harryette Mullen are reprinted), newly commissioned poetry by Morgan Parker and Simone White, and a new essay by curator Meg Onli.